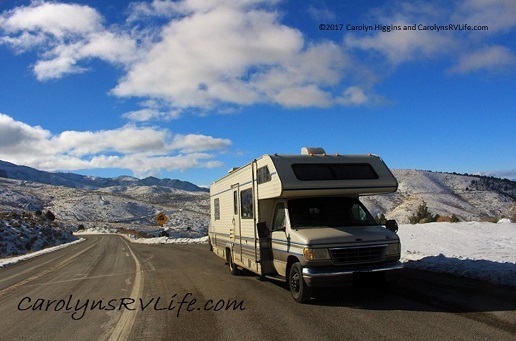 How to Drive an RV on Mountain Roads Without Killing Your Brakes! I recently drove my 29’ Class C RV over two mountain passes in one day. I climbed from sea level to over 7000 feet, back down to about 4000 feet, back up to 7000, and finally down to 4000’ again. This is a lot of work for a six-and-a-half-ton RV built on a van chassis. And as my brakes smoked and spewed the toxic odor of burning brake pads, I realized I had a lot to learn about driving a big Class C Motor Home on mountain roads. The more I drove, the softer my brake pedal became; I had to push it almost all the way to the floor to slow down. I eventually pulled over to let the brakes cool and that helped, but it didn’t take long for the pedal to get spongy again and by the time I reached the bottom of the grade I was barely stopping at all. (You can read the whole harrowing story here). I was able to get to the bottom safely by pulling over to let my brakes cool and using low gear, but it was nerve-wracking, to say the least! Once I was on flat land again I did research to learn what I’d done wrong to make my RV brakes overheat and fade on the mountain passes. Here is what I learned. Know Your Route and Prepare Ahead of Time! 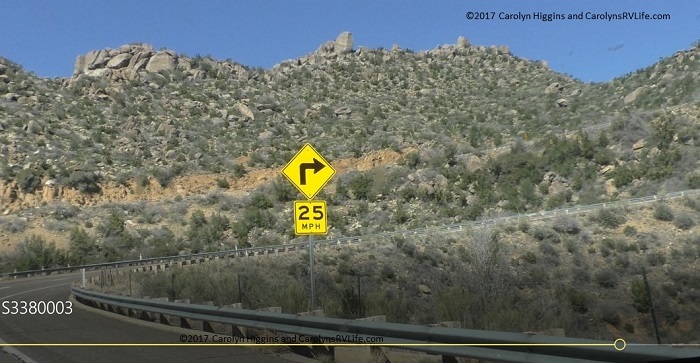 I’d driven my Class C RV on plenty of mountain passes in the Sierra Nevada’s, so when I glanced at the Google map and saw the squiggly lines of switch-backed mountain roads, I thought “piece of cake”. What I learned that day is that not all mountain passes are alike. Everything from the length of the grade, steepness of the grade, road conditions and weather can impact travel on mountain roads. The Lesson: Plan your route ahead. Ask others or do research on the route before you go. My mistake was doing both passes in one day. The grades on both were very steep and very long, causing me to use my brakes a lot! I should have done one pass and rested my brakes at least a couple of hours before tackling the next one. The Lesson: Keep your vehicle maintenance up to avoid dangerous or even deadly RV brake or engine malfunctions on dangerous roads. If my brakes had been old and worn out, a caliper had gotten stuck or I had a brake fluid leak my situation could have had a very different ending. Use Your Motor Home Engine to Slow You Down! You should also “shift into low gear before starting the downgrade”, advises the Family Motor Coach Association (FMCA). FMCA also states, “with motorhomes, a rule for choosing gears has been to use the same gear going down a hill that you would to climb the hill. However, new motorhomes have low-friction parts and streamlined shapes for fuel economy. They may also have more powerful engines. This means they can go up hills in higher gears and have less friction and air drag to hold them back going down hills. For this reason, drivers of newer motorhomes may have to use lower gears going down a hill than would be required to go up the hill. The Lesson: I drove a stick shift for years and if my RV was a manual shift, downshifting would have been a no-brainer. But with an automatic transmission, I’m always unsure when I should shift into low gear. 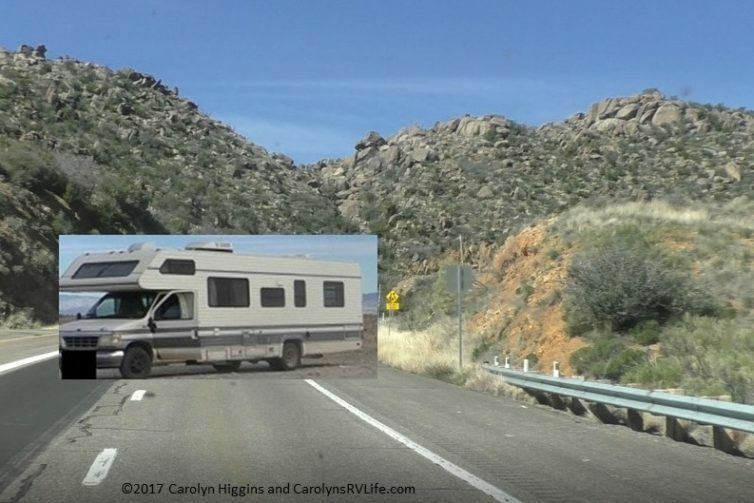 A rule of thumb, according to RVers Online who attended an RV Driving School is that if your “RV accelerates more than 5mph going downhill then you need to shift to a lower gear”. How helpful! I will be remembering that!! RV and Motorhome brakes overheat from excessive use – or “riding”. Riding your bakes on long steep downgrades will cause your brakes to fade- or with consistent use, to stop working completely. If you’re driving your RV or Motor Home down a hill and notice smoking, burning brake odor and/or brake fade, pull over as soon as you are able to do so safely and let the brakes cool. Turn off the engine and test the brake pedal if, after sitting a while, the sponginess disappears and the brake pedal becomes firm again, most likely your issue is brake overheating. It’s best to let your brakes cool completely before getting back on the road; that could take an hour or more depending on weather conditions. Overheating your RV brakes can cause permanent damage to your pads, rotors and calipers. If you do overheat them, it’s best to get them checked out by a brake service center as soon as possible. Do you have any RV driving safety tips you’d like to share? Or how about a scary story to share? Leave your comments below! 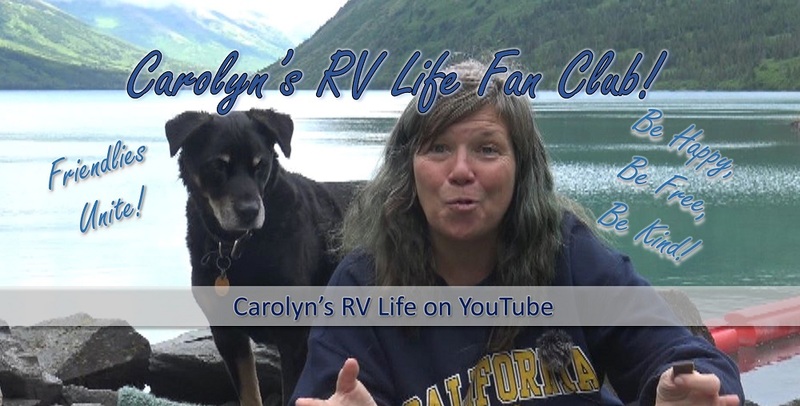 Share: How to Drive an RV on Mountain Roads Without Killing Your Brakes! 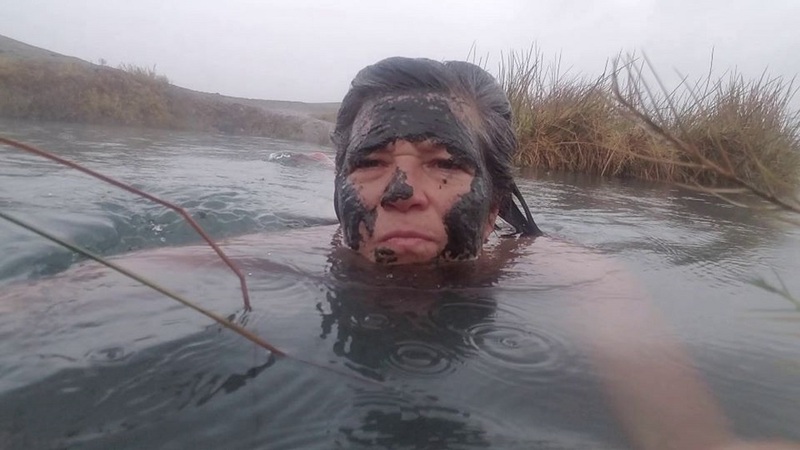 After watching your YT video about your descent down the mountain, I had to come to your blog to read more. I only have one suggestion for going down those mountains, when you are shifting into a lower gear, be sure you are going SLOW, or it could damage your transmission. So that being said, I would like to suggest that if you feel the need to downshift, do it at the top of the mountain, so as to keep your Motorhome from going too fast and then downshifting and that could break something inside the transmission. Hubby used to be a Motorman in the coal mines, he has taught me all I know about slowing down, or stopping on a steep grade. 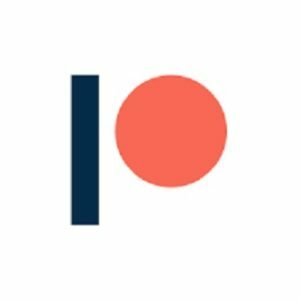 Thanks for all the great videos, and for this blog too. I will be reading more here too. Funny, as I was reading through your story, I was thinking how I always down shift going up hills and down hills when driving my SUV in the SNOW so I don’t stall or slide… not sure if it would have occurred to me to do the same on dry roads. Good lesson. Thank you. I am so glad to have this information Carolyn! I am going to be soon driving through some mountain passes and I can just see me going through the fear and white-knuckled experience that you did. I can’t tell you how much I appreciate reading your explanation as I know reading a technical Manuel would not have impressed nor kept me awake as much as reading about your first experience did. I want to thank you for sharing your journey with all of us who are hoping one day to be as free as you and Capone are. I especially appreciate your genuine honesty. You have taught me so many invaluable lessons. Thanks again for this practical and extremely informative article. God has richly blessed you with a gift for writing as well as helping all of your friendlies to prepare for our independence. May God continue to bless you and keep you. Thank you! I’m new to this and will be heading over a pass or two in the next few weeks. Thank you for that information, I would not have known that and will be headed to the mountains in the summer. Thank you so much. Great advice, as usual! Thank you for the tips. They apply well to any vehicle on steep graded passes! I understand that if you do have to downshift mid-way, make sure you are slowed to the RPM range for that gear before shifting. It reduces the strain on your transmission. Thank you again Carolyn! You are a warm, friendly, intelligent woman that inspires and reassures me that by allowing myself, I can be free! Brightest Blessings in all areas of your journey! Just getting started, and I really appreciate the experience talking. That’s good to know that if you do overheat your brakes that you should have them checked by a professional. My son was driving our RV downhill and we could see smoke coming out, so I’m pretty sure they overheated. We’ll have too find an auto service we can take the RV to to have the brakes looked at and repaired if necessary.